Let our Go Smiles cosmetic dentists can help you show off the smile you’ve always wanted! What are your Cosmetic Dentistry Treatment Goals? Modern and affordable cosmetic dentistry procedures can transform the appearance of your smile in as little as one visit. Do you want a whiter smile? A more properly aligned smile? Let our Go Smiles cosmetic dentists can help you show off the smile you’ve always wanted! What are your Cosmetic Dentistry Treatment Goals? Modern and affordable cosmetic dentistry procedures can transform the appearance of your smile in as little as one visit. Do you want a whiter smile? A more properly aligned smile? 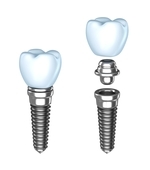 Want to replace a missing tooth? Our Go Smiles cosmetic dentists welcome the opportunity to listen to your oral health goals and we will build a unique treatment plan to help you reach them. The doctors of Go Smiles are here to make your visits as comfortable and pain free as possible. They will always explain treatment options in full and make sure you are comfortable with them before proceeding with any dental work. The entire staff strives to make each patient feel welcome from the moment they enter the door, easing the discomfort that many individuals experience when going to a dentist. Our cosmetic dentistry procedures at Go Smiles are performed using state-of-the-art technology. We recognize the importance of delivering the best possible care for all of our patients through the use of modern technological advances, which is why much of the diagnosis and treatment planning at our office is accomplished technology and digital x-rays. Not only do these digital imaging technologies make cosmetic dentistry safer for our patients, they also produce more predictable results and allow us plan your treatment more precisely. For several reasons, many dentists today recommend composite fillings over amalgam (mercury and silver) ones.Composite fillings are tooth-colored so they help maintain the integrity of the patients smile, and they leave a much smaller environmental footprint. Additionally, our dental office provides Zoom! in-office teeth whitening procedures for patients who want to restore the natural coloring of their teeth. For patient convenience, our Go Smiles dental office also provides Opalescence for at-home teeth whitening. Not only can replacing a tooth help to restore the beauty of your smile, but it can also help to maintain the density of the jaw bone. Our doctors provide several options to replace one or more missing teeth including dental implants and implant-supported dentures. If youre missing a tooth, several teeth, or an entire arch of teeth, please contact us to learn about your tooth replacement options. Questions? Ready for appointment with our cosmetic dentists? request an appointment, please contact us today! Ready to go schedule your appointment?